Exceptional senior care means that we care for the whole person. 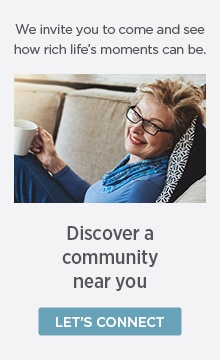 At The Goodman Group managed communities, our goal is to provide a nurturing environment where residents feel comfortable and have many opportunities to promote their wellbeing. Kristi, a Health Services team member with The Goodman Group talks about what exceptional senior care means to her. Our staff is excited about coming to work and strive to know each resident on a physical, emotional, mental and spiritual level. Exceptional senior care means that we care for the whole person and provide nurturing care as if they were our own grandparent. The Goodman Group places residents at the center of everything it does, personalizing our services to meet their preferences. We strive to build lifetime relationships with our residents by creating memorable experiences.